Your comment must be posted no later than 30 minutes before the Tuesday Feb. 10 class. 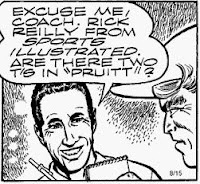 Pictured at right: Rick Reilly, formerly of Sports Illustrated, now with ESPN (the magazine). Mike Foss is following the life of Reilly this semester. This entry was posted on February 2, 2009 at 5:42 pm	and is filed under Uncategorized. You can follow any responses to this entry through the RSS 2.0 feed. You can leave a response, or trackback from your own site. Michael Rosenthal writes about the tension between weight class and public popularity in his Feb. 3 column. Fighters Vic Darchinyan and Jorge Arce are scheduled for a Saturday night matchup on Showtime. There is one problem however, they’re both 115 pound junior bantamweights. what’s a bantam? That said, Rosenthal examines the possibilty of whether such fowl-size fighters can ever get the attention they deserve. Rosenthal (like myself) follows the sport rather closely. And like any boxing fan knows, the smaller the fighters, the quicker the punches, the more action. The sport of boxing is suffering. Mainly because of the lack of any significant American heavyweight in a division that is packed with weak (boring, soft chinned) European fighters. Americans generally aren’t interested in watching 110 pound men fight each other. How could America relate to a 115 pound athlete? These matches usually do entertain, and since most of the boxers of Central American dissent, they have found some popularity in dense hispanic populations in the U.S. such as Phoenix and Los Angeles. Showtime and HBO won’t be able to bring in the revenue that a Moseley v. De La Hoya match might with such smaller lesser known fighters. But boxing fans will and should watch, and eventually they might garner a respectable level of public attention. One thing these two bantamweights have going for them are their personalities. Americans do like pageantry. Darchinyan and Arce are both falmboyant and talkative fighters(the latter once rode a dancing horse in his prefight ceremony). Rick Reilly wrote about his experience as a “designated fan” during the Bruce Springsteen half time show during the Super Bowl. Reilly describes a truly horrendous experience. He didn’t get to see the game, use the bathroom or even hear the Boss sing! Bill Plaschke of the Los Angelas Times writes about the NBA’s number one question: How good are the Lakers without Andrew Bynum? Plaschke provides the background history of last year’s season when Bynum has a similar knee injury and missed the entire season. The Lakers went on to the NBA finals and lost to the Boston Celtics. Many in the sports community believe it would have been a different series if the young center would have played. With the Lakers hot start this year, people were projecting a finals rematch with a different result–because of Bynum. Plaschke analyzes the Lakers chances without the young star and the harsh reality of his Bynum’s absence. Harper’s latest column is a follow up to the column he wrote on Joe Torre’s new book “The Yankee Years,” in which Torre dishes on what it was like to be part of the Yankees franchise. Torre recently went on “Larry King Live” where he defended his decision to share everything with the public—including what went on in the Yankees clubhouse. Harper includes multiple quotes taken from the interview and then analyzes the topics that were discussed and the topics that Torre either stepped around or omitted altogether. Harper has recently written columns based on both Yankees star Alex Rodriguez’s and former Yankees pitcher David Wells’ points of view. By doing so, he has provided his readers multiple sides to the issue, and has allowed them the opportunity to take a position as well. However, Harper has also made his own opinion known in his column “David Wells’ reaction proves Torre right on hefty lefty,” in which he defends Torre’s decision to slam Wells. Overall, this has been an interesting issue to follow, and Harper’s style of writing has just made it that much more enthralling. Sometimes Bill Plaschke doesn’t get credit for his humor, especially his sardonic wit. He loves the Times and he loves Los Angeles, and this prompts him to use his irritancies to crank out a few paragraphs of sheer entertainment- using his writing skills and his incredible knowledge to point his sights at people in the industry that he feels deserves a few barrages. This week it was Manny Ramirez, who finds himself in a tough place as a professional athlete – a tough and confusing place given his refusal to accept a huge salary offer from the Dodgers of two years at $45 million. Plaschke makes it clear what he thinks, and since I was never fond of Ramirez or his haughty opinion of himself I find the article informative and entertaining. Last Tuesday, Gary Parrish wrote a column on Bobby Knight, and why he should not be the next Georgia Bulldogs head coach. There is one huge factor Parrish says makes the hall of fame Knight a poor choice for this struggling-SEC squad. He does not go to AAU games, where much of the future talent is found. It is those players who shape the game and are the ones who make a name for themselves. Parrish makes his point, then proceeds to explain why he said what he said. He also went on to say he sits with Coach K (Duke), Roy Williams (UNC), Rick Pitino (Louisville), and many other big name coaches at these AAU games, but Coach Knight was never one of them. Parrish says regardless of what Dickie V thinks and says, and he says a lot, Knight should not be the next Georgia coach, if they intend on making a run through the SEC and the NCAA’s. He said to go get VCU Coach Anthony Grant or a coach on the rise….not a coach who is down and out (no offense Bobby). In this article, Cotsonika reports that the Lions will soon release their best corner, Leigh Bodden. Keep in mind the word “best” does not mean too much when talking about the Lions. Cotsonika nicely chronicles Bodden’s tenure in Detroit, going all the way back to when the team traded Shawn Rogers for him last off season. The Lions will release Bodden in large part due to his 8.6 million dollar bonus he is due at the end of the month. I don’t know who invented the running diary. But I do know that Bill Simmons has it down to a science. For those who do not know what a running diary is, it is essentially a blog of an event that is written as it is happening, usually for the purpose of humor. Elements included in a running diary include a description of what is happening and commentary on those events. 7:21 – Class just started. Apparently we’re going to talk about Aristotelian rhetorical criticism today. I could not be more excited. Whee. 7:25 – The professor is talking about his time in the Marines during Desert Storm. I’m not sure what this has to do with Aristotelian method. But oh well, it’s entertaining. 7:31 – I never understand this guy’s PowerPoint notes!! They don’t match up with what he is talking about. It is frustratingly confusing when teachers do that. Sorry, back to Bill Simmons. Anyway, Bill Simmons Tivo’ed the Super Bowl and went back and did a running diary of the last 18 or so minutes of the game. He is excellent at these running diaries. Not only does he do a good job of painting a picture of what is going on in the game, but he also has humorous and insightful commentary to go along with the events. 9:19 — Warner to Breaston for 12 yards. You can almost hear Michaels rifling through his “emergency story lines to bring up in case of a boring game” notebook. Page 3, Page 4 … back to Page 1 … I got it! Larry Fitzgerald’s dad is a sports writer! And he’s covering this game! The running diary is actually only the second part of his column. The first part, although it is short, is done as a traditional column. He explains how he is baffled by how the Steelers lost that game. One thing I noticed about Simmons in this column is that he does not write his traditional-style columns with short paragraphs. While Simmons is a good writer and I hope to emulate him in many ways, I will certainly use shorter paragraphs than he does for my stories. You will never guess what Tom Verducci wrote about this week. Okay, maybe you will. The topic of his most recent column was — not surprisingly — Alex Rodriguez. Verducci did what he always does, though. He took an angle to the story that few other people have, to this point. He decided to write about how the developments of the past few days are going to impact the slugger’s production this coming season. I noticed that Verducci cited Larry Bowa in his story. It’s clear that he has been in touch with Bowa in the past couple of days. Being able to track down one of the Yankees’ coaches for an opinion on the matter, as the story is still continuing to unfold, is one of the thing’s that makes Verducci so good at what he does. In Rick Maese’s last column he writes about the recent Michael Phelps recent scandal. He complains about the selective outrage over Phelps bong escapade while ignoring the actions of professional athletes(NFL) who use performance enhancing drugs. Maese ends by writing that in no way is Phelp’s actions equal to that of other athletes who cheat to get ahead. Maese uses descriptive words and phrase to liven up his stories. He does a lot of play on words. “And anyone who misguidedly thinks marijuana is more harmful than steroids is smoking something much stronger”. He also uses metaphors to make a point. In Rick Maese’s last column he writes about the recent Michael Phelps recent scandal. He complains about the selective outrage over Phelps bong escapade while ignoring the actions of other professional athletes(NFL) who use performance enhancing drugs. Phelps he explain is a disappointment in that he wasn’t quite ready for the role-modeling stuff that people place on professional athletes. Tom Boswell has an uncanny ability to bring a human quality to the teams he covers. In the opening paragraph of his recent article “Can’t Wait to be Great” about the Washington Capitals, he makes the reader feel bad for the team and its less than loyal fans. He talks about the team as though they are a bunch of kids (which they basically are) that are really making a go of it. Almost a “Might Ducks” type deal. While reading, whether a fan or not, you become interested and concerned about the progress the team can make. Leonard Shapiro didn’t have a column this week, so I will cover Sally Jenkin’s column. Sally Jenkin’s wrote about Michael Phelps and the whole ‘bong’ indecent. She had a very sympathetic view of Phelps, and was critical of the huge media storm that resulted. She points out the wide spread use of marijuana by college age students as proof that while Phelp’s behavior is not commendable, it is ultimately excusable. Michael Wilbon used his column the next day attack Sally for her position, claiming that her sympathy was misplaced. Wilbon claimed that Phelps already had his behavior excused in 2004, when he was caught drinking and driving. Jenkin’s stance is interesting however, citing ‘boyhood ADHD’ as the source of Phelp’s problems. I agree that the indecent was blown out of proportion, however when dealing with multi-million dollar endorsements it is image that the sponsors are paying for. Phelps is facing a backlash of his own creation. In Mike Wise’s column this week he spoke about the performances of Kobe and Lebron at Madison Square Garden. Kobe posted 61 points and, two nights later, LeBron scored 52. Wise made the point that Micheal Jordan’s 55 points in ’95 was more impressive than either because it was against a Knicks team that had the best defense in the league. Wise also said he was their for MJ’s performance which gave him first hand knowledge of the feat. Wise brought up that Kobe’s showing was more impressive than Lebron’s based on the number of shots taken and made– won by Kobe–and the margin of victory of the respective teams–won by the Lakers. But, in Wise’s eyes, neither compared to Jordan. Wise painted a picture of Jordan that is very foreign to us right now. Wise explained that “Micheal wasn’t Micheal, yet.” Wise used some play-by-play description of the game and quotes for players and GM’s to show the magnitude of MJ’s performance and why it trumps Kobe’s and LeBron’s performances. Wise also says that the defense that MJ received was considerably better than what Kobe and Lebron received, making MJ’s performance all the more astounding. Wise goes on to voice his opinion about the MVP of the NBA, saying that Lebron would get his vote right now. He supports his decision by referencing LeBron’s poor supporting cast, likening them to Lebron’s backpack. That’s harsh.